NOEL CELIS/AFP/Getty ImagesA streetside vendor shivers in the rain as weather patterns from Typhoon Yutu affect Manila Bay on October 30, 2018. At least seven people are dead and dozens are trapped as powerful Typhoon Yutu struck the northern Philippines on Tuesday. Landslides across the region triggered by heavy rains blocked roads, challenging search and rescue missions. Over 10,000 people from vulnerable villages have been moved to emergency shelters in several northern provinces. The affected areas are still reeling from last month’s Typhoon Mangkhut, which left more than 100 people dead and dozens more missing. 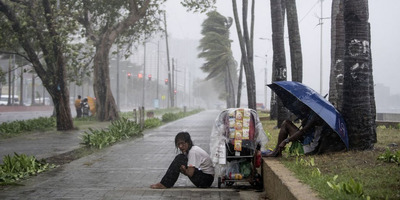 At least seven people are dead and dozens are trapped as powerful Typhoon Yutu struck the northern Philippines on Tuesday, Reuters said Wednesday. Regional police chief superintendent Rolando Nana said authorities were verifying whether a landslide triggered by heavy rains had trapped more than 20 people inside a government building in the mountain province on Nantonin, according to the Associated Press. Landslides across the region blocked roads, challenging search and rescue missions. A man and his three young daughters died in a landslide in Banaue, a northern area known for its mountains and rice paddies, according to the AP. Two others, including a young girl, died in another landslide in provinces near Ifugao. The super typhoon had barreled toward the Pacific Islands with 290 km/h (180 mph) winds last week, but had weakened considerably before hitting the Philippines. The storm whipped through the Sierra Madre mountain range, the longest in the Philippines, before heading west through Nueva Vizcaya, Benguet and La Union provinces. The same provinces are still reeling from last month’s Typhoon Mangkhut, which left over 100 people dead and dozens more missing.